The kick up is one of the those moves that is so simple and works every time if you know what to do. It's also one of those moves that many people never get the hang of. The problem people have is that they lose the rotational energy of the hoop when they try to kick it up. They do this by taking their foot out to the side or backward while performing the kick up. Your kick up foot should remain forward of your standing leg. Use leg one to do the kick up. Lift when the hoop rolls onto the foot. You can try it from foot circles or from a kick start. It's easier to see the foot position if I remove the hoop. Try to keep your foot at 90 degrees to your leg. Lift straight upward, keeping your foot forward. Lift your leg to knee height. Try not to let your foot go backward while lifting. the hoop is at knee height. 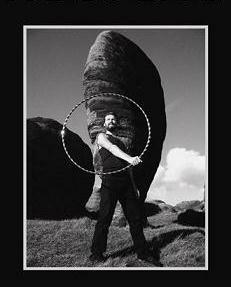 The hoop is level and catchig into the back of knee two. Foot one is dropping back down. 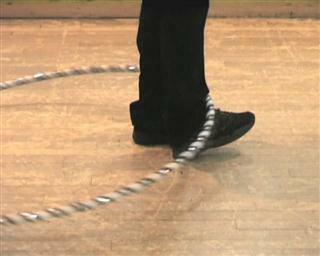 It's very simple and if you are comfortable with the hoop on your knees and your foot then you should get it quickly. Use the Elvis leg to help catch the hoop onto the knee.